Jonathan Webb, left, and University of Pikeville President Dr. Burton Webb, right. 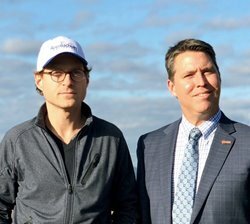 PIKEVILLE, Ky. (Feb. 14, 2018) – The University of Pikeville is working alongside AppHarvest in its goal of making Eastern Kentucky the high-tech greenhouse capital of the U.S. The agricultural startup, founded by emerging entrepreneur and Kentucky native Jonathan Webb, will break ground on its first $60 million high-tech greenhouse in spring of 2018. The company selected to locate in Pikeville, Ky., due to its geographic location and access to nearly 70 percent of the U.S. population within a day’s drive. Utilizing revolutionary growing techniques, AppHarvest will supply sustainable produce to consumers nationally. AppHarvest is currently operating from an office located in UPIKE’s new Health Professions Education Building. The university is actively exploring the idea of developing curriculum that aligns with the high-tech Ag industry and specifically provides valuable skills desired by AppHarvest’s large-scale greenhouse operation. UPIKE President Dr. Burton Webb and Provost Dr. Lori Werth plan to visit Wageningen University & Research and HAS University of Applied Sciences this month. Both institutions are located in the Netherlands, which has earned a reputation for being the high-tech Ag capital globally. Burton Webb and Jonathan Webb, who are of no familial relation, quickly formed a collaborative relationship. “Businesses like AppHarvest are looking to Appalachia because of our beautiful surroundings, willing workforce and open arms. We are pleased that AppHarvest is investing in the lives of Appalachians as we work together to build a new, more diverse economy,” Burton Webb said. U.S. Congressman Harold “Hal” Rogers (KY-05) commented on the importance of developing a high-tech workforce and diversifying the economy in Appalachia. Today, Revolution’s Rise of the Rest seed fund announced it has made an investment in AppHarvest, Inc. The fund is managed by AOL co-founder Steve Case and J.D. Vance and is backed by more than 30 iconic business leaders including Amazon founder Jeff Bezos, Starbucks chairman Howard Schultz, fashion designer Tory Burch and Alphabet chairman Eric Schmidt. The Rise of the Rest seed fund supports entrepreneurs outside of Silicon Valley and other coastal tech hubs. “The Rise of the Rest investment brings national attention to the model we’ve created in Pikeville, Ky.,” said Jonathan Webb.